Concerned that the Trump Administration will fail to meet its annual refugee admissions ceiling for FY18, Refugee Council USA (RCUSA) launches a weekly accountability system that will update the number of refugees who arrive each week through an online tracker. In the face of the worst refugee crisis in recorded history, RCUSA is dismayed by the FY18 refugee admissions ceiling of 45,000—the lowest since the inception of the U.S. Refugee Admissions Program in 1980. The administration’s most recent executive order banning refugees from 11 countries for three months, indefinitely suspending following-to-join spouses and children, and mandating unnecessarily burdensome data requirements for refugees has RCUSA concerned that far fewer than 45,000 people will be able to find safety and freedom here in the United States. 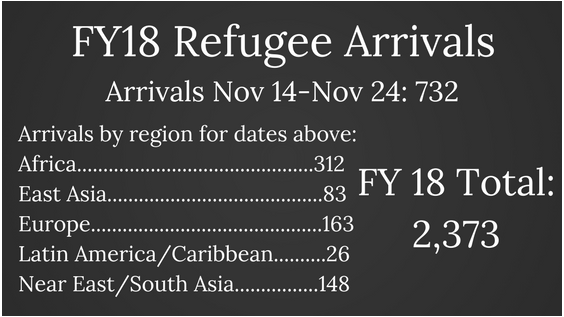 Every-other-Monday, RCUSA will publish updated data on its website, reflecting the number of refugee arrivals to the United States in total, and broken down by region, from the prior week. Through this tracker, we will hold the administration accountable to admitting 45,000 refugees in FY18. RCUSA will amplify the data over social media and will update the tracker on its website weekly through the entirety of FY18.